This site is maintained by the A.A.General Service Committee of Western Massachusetts (Area 31) for the purpose of enhancing unity by providing information pertinent to the General Service structure and functions within Area 31, as well as providing a communication platform for Area committees, members, officers, districts, interested AA members, and the general public. All Area Committees, each District, and the Area Officers are encouraged to share information about on-going service opportunities. Area General Service Meeting; - 7:30 pm 2nd Wednesday of the month. 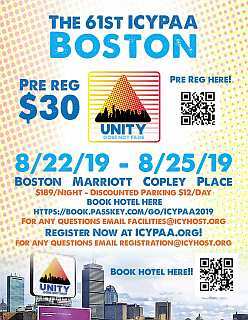 The 61st ICYPAA will be held in Boston. Register now at icypaa.org. Pre-registration is $30. What is a Round-Up and What Happens? For Questions, Information on the Round-up or how you can get active by volunteering, go to http://area31aa.org/round-up or email the committee at roundup@area31aa.org. Registration Forms and Times of Events coming soon! It is a great event for all of our AA fellowship, GSRs, Group and Committee Chairs to attend and learn about Area 31 and to show support to AA.